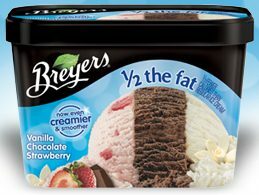 [Circa 2009] Wow, I finally cracked open my container of Breyers Smooth & Dreamy Vanilla Chocolate and Strawberry. Unfortunately I think I waited to long because the texture is a bit off: the chocolate is reminiscent of a popsicle texture, the vanilla is part way there, and the strawberry seems least affected by the freezer burner or whatever unfortunate things happened to this particular container. I'll have to pick up a fresher container, but as it stands, this definitely has my approval. The vanilla is fine, and the strawberry is nice. the chocolate texture through me off, so I'm not positive about the flavor. 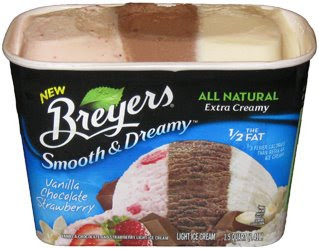 Overall, you have to love this new line that Breyers has come out with: all natural and low fat, well, and tasty. What's the point of low cal if it's chewy. 2012 Update: "Smooth & Dreamy" moniker is gone, but the light ice cream lives on. Notice it's "now even creamier & smoother" which can be translated to "not all natural". The new recipe has also led to the loss of a gram of protein. had the cookies and cream and it is so bad. just crumbles out of the box. not at all smooth and dreamy. OMG, I had the cookies and cream too...it crumbles...it is plain awful, the texture is not ice cream like. You almost have to melt it and smash it with a spoon to turn it into ice cream. We had never seen ice cream that would not form a scoop before we bought this terrible stuff. Using several different kinds of ice cream scoopers and spoons, all we could muster up were measly clumps that would not stick together. It was not possible to make scoops for cones, etc. (Straight from the store; no freezer burn.) There is absolutely nothing smooth and dreamy about it. Just horrible!